With any drive way, after a time it will always start to look dull as it accumulates the grime and dirt from our footfall and the general environment. If the drive has been laid with the right materials your driveway should have plenty of endurance and life left in it. Your driveway just needs a little tlc and basically a good old clean! We have the professional equipment and the experience to make this a no fuss, no hassle but rewarding job. 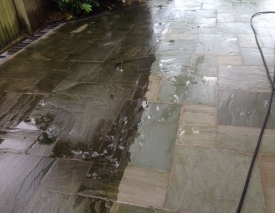 A professionally jet washed driveway can really transform the look of your property as well as ensure your drive lasts as long as it truly should. You no longer have to keep putting this job off; it can be as easy as giving us a call or dropping an email and you can then leave the rest to us. The time and cost to carry out the job understandably depends on the size of the driveway. With accurate details given, we can give you an honest and fair quote for the jobs completion. Our customers get an instant feeling of satisfaction and relief when we have completed the job and leave their driveway looking smart and imaculate. This has left many calling on us to provide further driveway care.